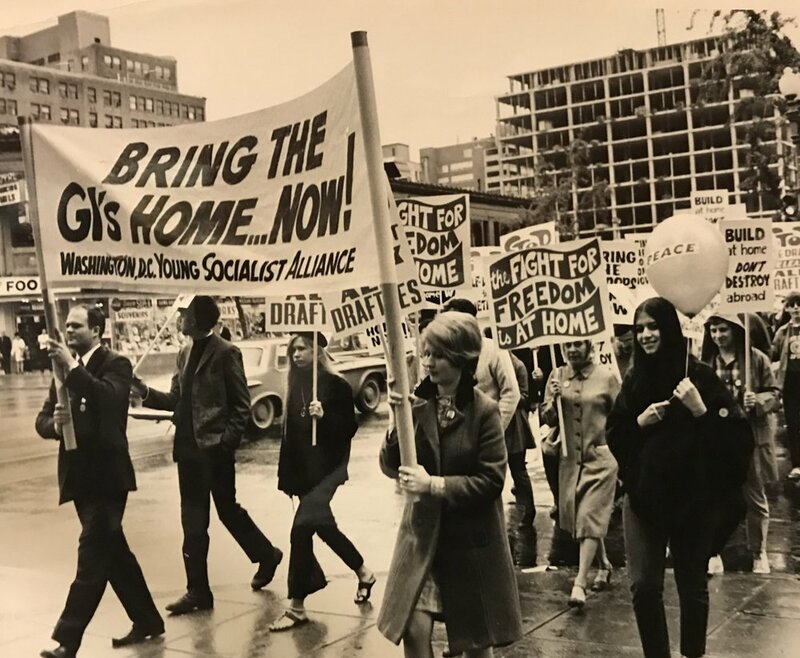 #OTD 27 April 1968 Anti-war and anti-draft activists rally at the Selective Service Selective Service headquarters (916 G St NW), the location of the local draft board. This rally took place on a very wet day after the DC Public Schools student-led rally and march the day before. This strike was also part of a national protest against the war. The rally was coordinated by the National Welfare Alliance (NWA), National Black Anti-War and Anti-Draft Union (NBAWADU) , Women Strike for Peace, Washington, DC Young Socialist Alliance, Federal Employees Against the War in Vietnam (FEAW), among others, under the aegis of the National Mobilization Committee to End the War in Vietnam. Protesters met at Franklin Park (14th & K Sts NW) and marched to 9th & G.
Etta Horn, NWA Vice Chair, shared with a reporter, "So many of our black boys are dying in that country--but they haven't had a chance to live in this country." Jan Bailey, NBAWADU local head, shared with a reporter, "They tell us we're living in a free democracy. But black people have never known democracy, only hypocrisy." There was also a large FEAW contingent wearing "yellow hand-lettered badges." Please comment below. Did you, a family member or neighbor participate in the march? Do you recognize anyone in these images? Were you a draft resister? You may comment privately here. Photo: Courtesy DC Public Library Special Collections. Paul Schmick, photographer. Barry Kalb, "War Protest Group Marches in Rain," Evening Star 28 April 1968.